Study: Hepatitis C Infected Organs OK For Heart And Lung Transplants : Shots - Health News Researchers found that antiviral drugs are effective in preventing transmission of the hepatitis C virus from donated hearts and lungs to recipients. The result could help reduce organ wait times. 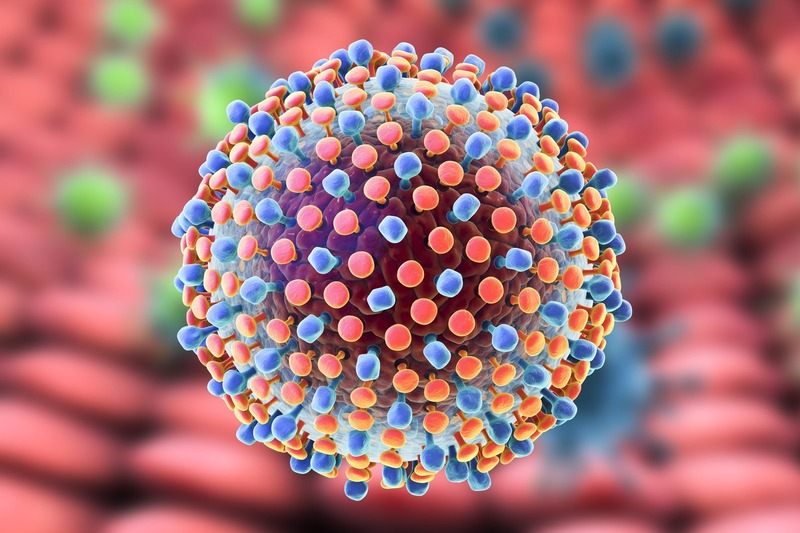 The presence of the hepatitis C virus in donated hearts and organs for transplantation wasn't an impediment for a successful result for recipients. Typically, these organs have been discarded because of concerns about spreading the viral infection. But a study of heart and lung transplants published Wednesday by the New England Journal of Medicine finds that new antiviral drugs are so effective that the recipients can be protected from infection. And, as another sad result of the opioid epidemic, organs for donation increasingly carry the hepatitis C virus. People who use injected drugs and share needles are at high risk of hepatitis C infection. These organs represent a resource the transplant surgeons at Brigham and Women's Hospital in Boston didn't want to go to waste. They decided to run a study to see whether the organs could be safely transplanted. Mike Caldwell volunteered. Seven years ago, he was diagnosed with chronic obstructive pulmonary disease. He had worked for many years rehabbing concrete floors and hadn't worn a face mask as cement dust and chemicals swirled around him. He also smoked. The Kingston, Mass., resident says an oxygen mask kept him alive, though eventually he couldn't even climb the stairs. He got on the list for a lung transplant. "I was waiting for the lung and waiting and waiting," he says. "I needed a double lung transplant." Three years went by. Then in the spring of 2017, a researcher at Brigham and Women's asked him if he would consider enrolling in a clinical trial. He might end up getting lungs from a donor who had been infected with hepatitis C. If so, he would also get a course of antiviral drugs that can block transmission of the virus. "I had to think about it," he says. "It wasn't a decision overnight." But in the end, the risks seemed manageable, certainly compared with the possibility of dying while still waiting for a suitable donor. "I really had nothing to lose at that point in time," he says. Just a few weeks after he agreed to participate, he got lungs from a donor who had been infected with hepatitis C.
Now, the 59-year-old Caldwell says he is doing fine. At first he started to panic when he couldn't feel the familiar oxygen mask on his face. Then he realized he didn't need it anymore. Before the transplant, "I couldn't even think of doing something without running out of air," he says. Brigham and Women's Dr. Ann Woolley, who organized the study, says participants didn't get moved up on the transplant list, but by enrolling in the study they had access to a larger number of organs. Woolley says given the sad reality of the opioid epidemic, these organs have become common in the past few years. "Over a third of all of our heart and lung transplants that we've done at our center have been from donors who had hepatitis C," she says. Caldwell is among 44 patients in the study who had heart or lung transplants from infected donors. Woolley says the challenge hasn't simply been medical. More than two-thirds of the donors with hepatitis C in her study were recent drug users, including people who died of overdoses. Doctors and patients raised concerns about the quality of their organs. "I think that is a stigma that very much is widespread," she says. "Fortunately that pendulum is beginning to swing." She says the organs accepted for transplant from drug users weren't lower quality. They met the same high standards as any donation. And the outcomes she now reports are encouraging. "We've had a 100 percent success rate, both in terms of the hepatitis C clearance as well as how well the patient has done after transplant," she says. This isn't a definitive study, because it involved a small number of patients and the initial follow-up period was just six months. "The early results are very encouraging, but there is still a lot to learn," writes Dr. Emily Blumberg in an editorial accompanying the study. Blumberg, at the University of Pennsylvania, says she would like to see studies with longer follow-up periods. Once concern is that these transplant recipients could have a higher risk of heart disease in later years. Still, more than 12,000 people on organ transplant lists die while waiting for a suitable organ, Blumberg wrote, so it's time to consider expanding the use of these transplants, at least under controlled conditions. Evidence is growing for the use of these organs. There have been similar small studies showing success with kidney and liver transplants. Recently, the director of the transplant center at NYU Langone Health, Dr. Robert Montgomery, needed a new heart himself. As The Wall Street Journal reported, he accepted one from a drug user who had hepatitis C and had died from an overdose. A study last year concluded that heart transplant recipients were better off accepting an infected organ, compared with holding out on the waiting list for an organ that is not from an "increased risk donor." A single donor can potentially give as many as eight or nine organs, says Adnan Sherif, a kidney transplant doctor at Queen Elizabeth Hospital in Birmingham, England. So expanding the pool of available donors to include these organs can potentially help many people. In addition to hepatitis C, some of these organs carry the risk of transmitting hepatitis B or HIV, Sharif says, but those conditions are manageable as well. And the new drugs to block or cure hepatitis C infections make a huge difference. "I don't think there's many people who doubt these drugs are effective," he says. "We could increase the pool of these organs. I think the real question really is with regards to the financial reimbursements." He is encouraged to see that the transplant team in Boston was able to block transmission of hepatitis C with just four weeks of treatment with these expensive drugs. That's much less time than it takes to treat someone who is being cured of a hepatitis C infection, and it can save potentially tens of thousands of dollars.